Claas Jaguar 960 Terra Trac is the first series production forage harvester available on tracks instead of wheels. Picture for Peter Hill machinery story. Home-made conversions have been seen before, notably in the Netherlands where farmers and contractors seem keener than most to spend a lot of money on bespoke machines to help protect their soils. 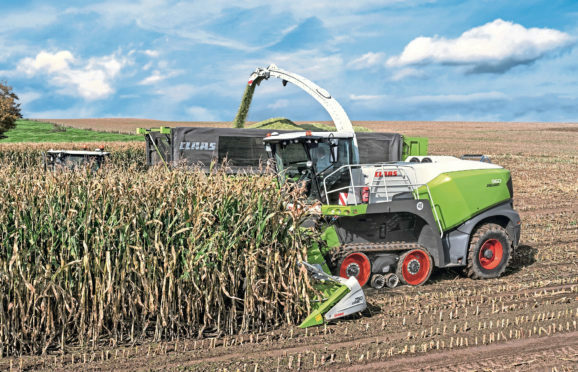 But now Claas has become the first mainstream manufacturer to produce a factory-built option in the shape of a Terra Trac system for the Jaguar 960. Coincidentally, it is 30 years since the company introduced the first-generation Terra Trac design for Lexion combines, with subsequent designs benefiting from hydro-pneumatic suspension and 40kph top speed, the latter largely thanks to more durable traction belts. In the meantime forage harvester weights have increased as bigger, heavier engines and more equipment have been installed to keep increasing performance and productivity. The Jaguar 960 weighs in at around 13 tonnes with a grass pick-up of more than 15 tonnes with an Orbis maize cutter on the front. It can be equipped with generous 900mm wide 38in tyres but that pushes its transport width to almost four metres. This means 800mm sizes are more commonly used to make a compromise between compaction in the field and the ability to swiftly move from field to field on the roads. With the widest – 890mm – traction belts fitted to the Terra Trac version, the machine is no more than 3.5 metres wide and operators can get that down to barely 3 metres by fitting the narrowest 635mm belts. And they still benefit from a contact patch more than twice that provided by an 800mm tyre, says Claas, with a tyre pressure adjustment system for the rear axle completing a package said to provide the optimum in soil protection and mobility. A unique feature, designed to minimise surface scuffing when picking up grass, is the track lift mechanism, which raises the front idler wheel to reduce the contact area by about a third but still more than a tyre provides. The Jaguar 960 is a mid-range model in the 900 series, powered by a 626hp MTU Mercedes-Benz straight-six engine. Meanwhile, a 24.2-litre V12 engine from construction machinery giant Liebherr powers the latest big-capacity forage harvesters from John Deere. These are reckoned to deliver up to 10% more output while consuming 10% less fuel. They replace the current top-end 8000 Series “wide body” harvesters, while the standard line-up is expanded with the 625hp 8600 to bridge the performance gap. On 710/75 R42 drive tyres, the 8600 and other models in this series are less than 3m wide. John Deere says they can be equipped with AMS precision farming system features such as forage constituent analysis and yield mapping.